In the Hindi language, some words are commonly used in a number of different ways, or used in ways that don’t reflect their literal meaning. This often makes word for word translation from English to Hindi, or Hindi to English, difficult. 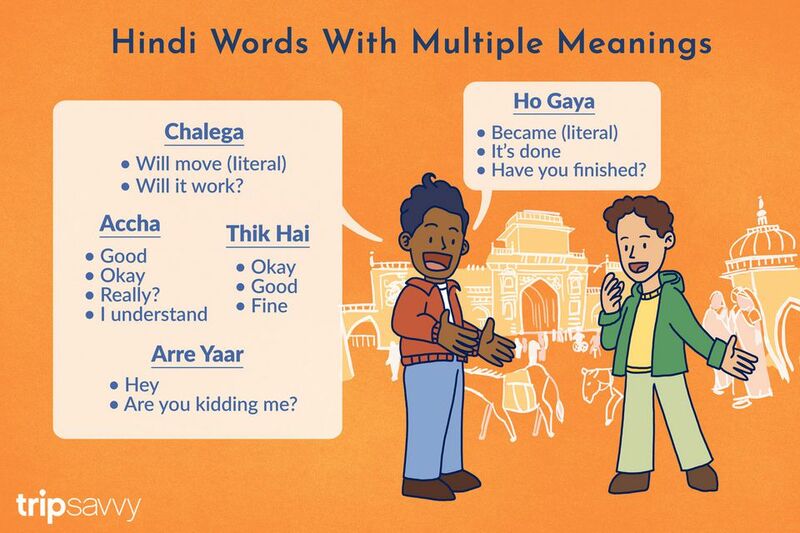 Here are some popular Hindi words that you’ll often hear, but may be confused as to what they actually mean or the context they’re used in. If you're keen to learn Hindi in more detail, these Top 6 Hindi Language Books and Resources will help you. This multi-purpose word literally means "good". However, it also takes on a number of other meanings, depending on the intonation it’s given and where it’s positioned in a sentence. It could also mean "okay", "really? ", "I understand", "oh! ", or "I have a question". "Thik hai", pronounced "teek hey", literally means "is fine". In this regard, it’s a bit like the word “achha” and is often used along with “achha” or instead of “achha”. “I’m going shopping to buy milk, bread and vegetables. I’ll be back by 3 p.m.” “Achha, achha, thik hai”. (Okay, good, fine). “Thik hai, I’m going now” (Alright, I’m going now). Thik hai is also a common reply to the question of how you’re feeling. It can also be said casually in a rising tone of voice to ask someone how they’re feeling. “Thik hai?” If you’re only feeling so-so, the response would be "thik-thik". Otherwise, reply “thik hai” in a neutral tone. This word is notorious for its different meanings and spellings. Most visitors to India know it in the context as it refers to a seller or vendor of something. For example, a taxi-wala is a taxi driver. A vegetable-wala is a vegetable seller. However, wala can be combined with the name of a town or city to indicate someone who comes from there. For example, Mumbai-wala or Delhi-wala. Wala can also be used to specify a certain thing. For example, chota-wala means small one, lal-wala means red one, kal-wala means yesterday’s one. Finally, it can be used to indicate something is about to happen in the immediate future. For example, ane-wala means about to come or about to arrive. Jane-wala means about to go or about to leave. "Chalega" literally means “will move” or “will walk”. However it’s most often used by itself, as a question or a statement as to whether something will work. It's particularly common in Mumbai slang. For example, you’re shopping for toasters with friend and she picks one up and says “Chalega?” If you like it, you’d reply “chalega”. If you really like it, you could even add another “chalega” for emphasis and say “chalega, chalega”. Or, add a head wobble too! Another situation where chalega is used is to ask if someone will go somewhere. For example, "Airport chalega?" Related to "hogaya", "ho jayega" is the future tense combination of “be” (ho) and “will go” (jayega). Its literal meaning is "become". This word is often used as an affirmative in response to a question about whether something will happen or take place. "Will the work be finished tomorrow?" "Ho jayega". Make sure it sounds convincing though, as some people feel that it's more polite to give a positive answer rather than a negative one (even if they don't really mean it). This widely used term was added to the Oxford Dictionary in 2015. It's literally translated as "hey" (arre) "mate" (yaar). However, it can have many meanings depending on the intonation. These can range from a shocked, "Are you kidding me?" (rising intonation) to an expression of frustration (falling intonation). "Arre" is also commonly used by itself without the "yaar" in a similar manner. Said in a neutral tone, it's used to get someone's attention. Said with a rising tone, it conveys surprise (hey, what?!). Said with a falling tone, it conveys exasperation or irritation.